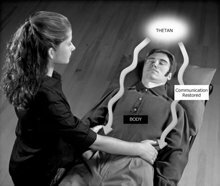 The Body Communication Process is used when a person has been chronically out of communication with his body, such as after an illness or injury, or when the person has been dormant for a long period of time. The Body Communication Process does not in any way replace or alter Touch Assists or Contact Assists. Where a person has been injured or has specific areas of the body where an assist is needed, the Touch Assist or the Contact Assist should be used. This process may be done only after any necessary medical attention or other necessary assists have been done. It is not done in place of these. The purpose of the process is to enable the being to re-establish communication with his body. 1. The individual lies on his back on a couch, bed or cot. Doing this assist on the clothed body with shoes removed gives satisfactory results. Any constricting articles such as neckties or tight belts should be removed or loosened. It is not necessary to remove any clothing except for heavy or bulky garments. Where more than one session of this process is given, the body position may be varied to advantage by having the person lie face downward during alternate sessions. By placing the hands in different positions and getting the person to feel them, someone who is ill or injured can be brought back into better communication with the body. 3. Explain the purpose of this process to the person and tell him briefly what you are going to do. 4. Have the person close his eyes. Then place your hands on the individual’s shoulders with a firm but gentle grip, using an agreed-upon firmness, and give the command. 5. When the person replies that he has, acknowledge him. 6. Place your hands in different positions on the body, giving the command and acknowledging the person each time after he has responded. Touch the chest, front of chest, sides of chest, both sides of the abdomen at the waist, then one hand going around the abdomen in a clockwise direction. (Clockwise because this is the direction of flow of the large bowel.) Continue with both hands on the small of the back, one on each side and lifting firmly; one hand placed over each hip with firmer pressure on these bony parts, then down one leg to the knee with both hands and down the other leg to the knee with both hands, then back to the other leg and down over the calf, the lower calf, the ankle, the foot and the toes and down the other leg from the knee to the toes. Then work upward in a flow towards the shoulders, down each arm and out to the fingers, both hands behind the neck, one on each side, sides of the face, forehead and back of the head, sides of the head, then away toward the extremities of the body. An infinite variety of placing of the hands is available avoiding, of course, the genital areas or buttocks in both sexes and a woman’s breasts. The process proceeds up and down the body, toward the extremities. The individual describes what just happened or what is happening. You leave your hands in position with exactly the same pressure while the individual is talking. The communication is acknowledged and you then continue with the process. The assist should not be continued past a cognition and very good indicators.